Join chirpy Chowder and his gastronomic gang for a scrumptious stew of puzzles, quizzes, mazes and games. 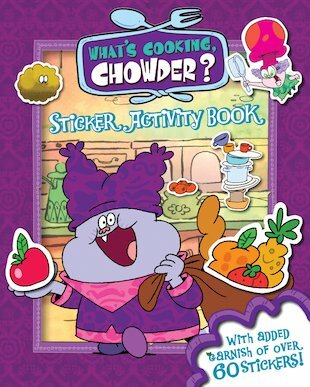 Laughter is definitely on the menu in this tasty introduction to Chowder’s world! Chubby Chowder is the enthusiastic apprentice to the great chef Mung Daal – although his devotion to eating food often gets in the way of his ability to cook it. Now Chowder, Mung Daal and all his friends whip up a feast of activities, full-to-bursting with scrummy stuff to do – and topped off with over 60 stickers! It’s all cooking in Marzipan City!